We'd like you to considering becoming our fan on Facebook. Great photos, current events, and a nice complement to our website. Please ask your friends to join as well. This is a double bill, and a first in Canada. The artistic and production teams are in place, support from the Nikkei community has been tremendous, coaching has begun, and in May you will see something utterly unique: Natsu Nakajima & Benjamin Britten. Japanese dance & Western opera. Together. Please join us at the Frederic Wood Theatre, UBC, on 26, 27 and 28 May at 7:30pm, and 30 May at 2:30pm. Lots of parking at the nearby Chan Centre. General admission, $40.00. Students with current ID, $26.00. We believe this will sell out, as did our Emperor of Atlantis last season. This is rare and special work. It is the simple and universal story of a woman driven mad by the loss of her child. It is the same story told from the vantage of two cultures. 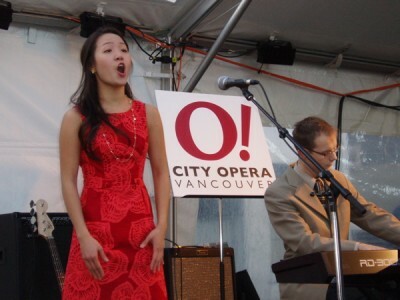 In 2011, very early in the New Year, City Opera will be doing our first run-out event. It will take place in White Rock -- very special, and much fun. More news to come! City Opera members and supporters were given a unique bargain last month, and many of our friends took full advantage. We'll be offering more of the same to come - in thanks for your support of our work. And thanks to our friends at the Kay Meek Centre for making it possible. City Opera remains deeply committed to bringing our people and our music to Canada's poorest neighbourhood. We were last there on 19 February, performing at the Homeground Festival at Oppenheimer Park, under the auspices of our friends at the Carnegie Centre. Caroline Jang, soprano, and Michael Onwood, piano gave a programme of Gounod, Douglas Moore, Schubert, Arlen & Harburg, Gershwin, Andrew Lloyd Webber, Puccini and more to an enchanted audience of about 70 people. It was a wonderful hour.